On the South Slope of the Acropolis, and between the Herodeon and the Theater of Dionysos stretches the Stoa of Eumenes. Behind and above the stoa, the Sanctuary of Asclepios, the Greek God of Medicine, and a fully functioning hospital of the time were built. One could not choose a more favorable location for a hospital. There, in a charming nook, and hidden from the eyes of the curious, the sick patients were entirely sheltered from the Northern winds, and, on the contrary, they could breathe the calm sea breeze, while, during the winter, the salutary sun-rays make this spot a true thermal station under the Acropolis. Site Plan, Left to Right: Herodeon, Stoa of Eumenes, Asclepieion (behind the stoa and left of the theater), and the Theater of Dionysos. ​This sanctuary was founded during the plague of 429 BC, which annihilated a considerable part of the population of Attica. It is then, that a deputation was sent for the sacred serpent of Asclepios to Epidauros, considered as the cradle of the cult of the god of health. The Asclepieion of Athens, occupying all the southern part of the terrace, is surrounded by an enclosure, the Sacred Precinct, many vestiges of which are still noticeable. This enclosure measures 100 m. (330 ft.) in length by 30 m. (99 ft.) in width, and contains the three indispensable elements for a sanctuary of Asclepios, that is a sacred spring for purification, a temple and a portico, i.e. the abaton, the dormitory where the patients, lying on their beds waited in the darkness of the night for the visit of the god. Asclepieion, south slope of the Acropolis, Athens. Above it there was a balcony, or upper floor, attained by stairs on the East. At the NW angle of this portico s square platform can be seen, raised to a height of 2 m. and attained by stairs on the SW side. In the interior of this platform is a sacrificial pit in polygonal display. Above it, there was a marble canopy, resting on four small columns. This was the "vothros" destined for sacrifices to the infernal gods and the souls of the dead, or, according to another theory, the cage for the sacred serpent of the god. It seems that with the passage of time, and the growing needs of the city, the Asclepieion of Athens expanded considerably so that it ended having two sanctuaries within the same enclosure, two springs, two temples and two dormitories, on both the East and West of the complex. As the visitor mounts the terrace, one first encounters the Temple of Asclepios, of which only the foundations remain. It is a small building of 10 m. (34 ft.) by 6 m. (20 ft.). Its front was later ornamented with a peristyle. Before the temple stood the altar of the god. Behind the temple one can see the foundations of the stoa, or arcade, 49 m. (162 ft.) by 9 m. (33 ft.), the most important edifice in the sanctuary, where the patients would wait to be healed. It was divided by an inner row of columns, probably Ionic, into two naves. The exterior colonnade had 17 Doric columns with marble architraves. ​On the Western part of the terrace one can see the foundations of another building 28 m. (91 ft.) by 14 m. (46 ft.) composed of a stoa, open at the South with Doric columns and four square chambers of 6 m. at the further end. This building was probably the dwelling of the temple officials. The sanctuary of Asclepios was decorated with several votive offerings, reliefs, small statues and other objects of art, which have been moved to the National Archaeological Museum. Other than the buildings already mentioned, beyond the enclosure was also a Sanctuary of Themis, a Temple of Aphrodite, remains of a very old tomb, possibly of Hippolytos, and many vestiges of Pelasgic habitations. 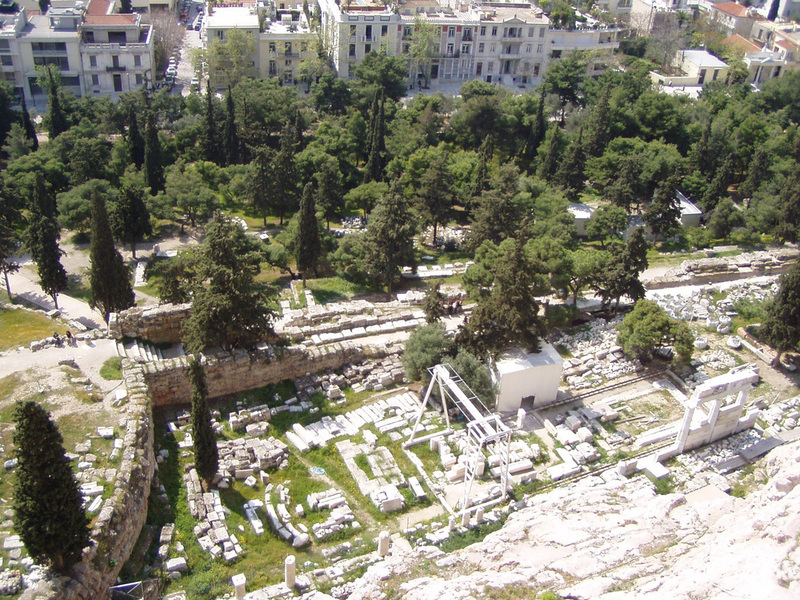 The archaeological site of Asclepieion, south slope of the Acropolis, Athens. In Greek mythology and religion, Asclepios was the Greek God of Medicine, son of Apollo and Coronis. His name is as a result of his birth since his mother had to have her womb cut open in order for him to be born, now known as a c-section. Asclepios means "to cut open". ​According to mythology, as he was growing up, Asclepios was taught medicine by the centaur Chiron. Through his studies, he had become so deft in the art of medicine that he was able to return the living from the dead. 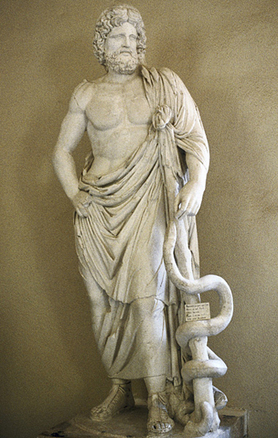 ​The symbol of Asclepios is a snake wrapped around a staff which is seen throughout all medical societies as well as the American Medical Association in modern times. The site of the Theater of Dionysos (left) and Asclepieion (right), south slope of the Acropolis, Athens. At the far left, the Acropolis Museum.